Hello Matthew James! Thanks so much for taking the time to answer some questions for our readers. Q: Please start by telling us something about yourself and what inspired you to start tattooing? A: To be creative! One of the last vestiges of excitement an otherwise banal landscape! Tattooing is simply another medium, far from the money making and 'industry', it is mark making at a very personal level. As my journey proceeded so did my critique of why tattooing made sense to me, it became more of a regular process. But it's been a balance of travel, writing, drawing along the way. Q: Was it hard to learn the basic skills? Did anyone help you in the process or you're self-taught? A: I came from a self taught background, for the first few years I was tattooing in a squat in the UK. I dropped out of art university, then I traveled to Australia, then to America and Europe beginning to work in the occasional tattoo shop. I did this for about 9 years. Visiting every museum and art gallery I could come by, studying the 'masters', especially in Europe. I attended art classes, technical drawing seminars, live drawing. I painted graffiti, I learnt air brushing, but mostly simply sketching things around me on my travels, pencil and paper is the easiest medium to travel with. It was/is always in my bag. Q: Your tattoo technique is awesome! 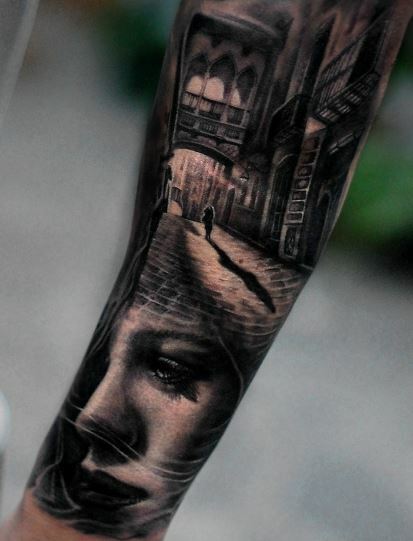 You make such a beautiful balance between black and white ink, brilliant highlights and nicely done details. 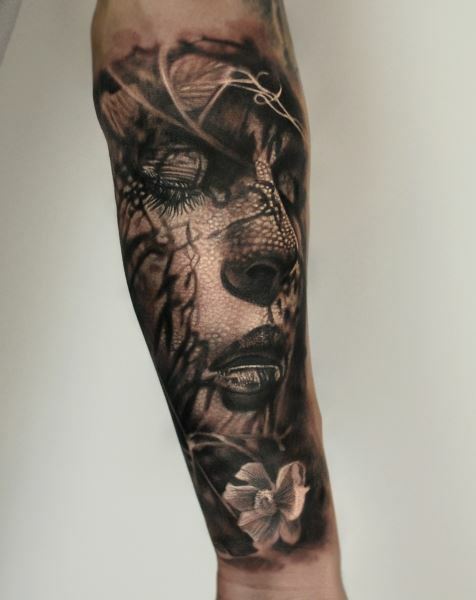 Every tattoo to look so great, even when is healed. 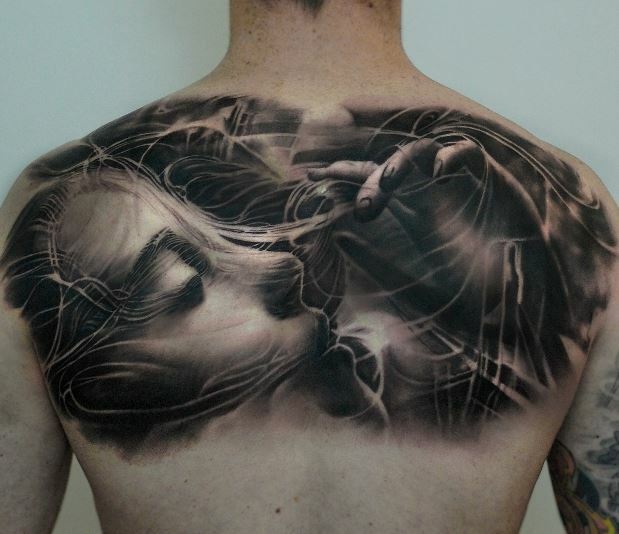 How much the knowledge of tattoo ink plays a big role? You can point out some important aspects. 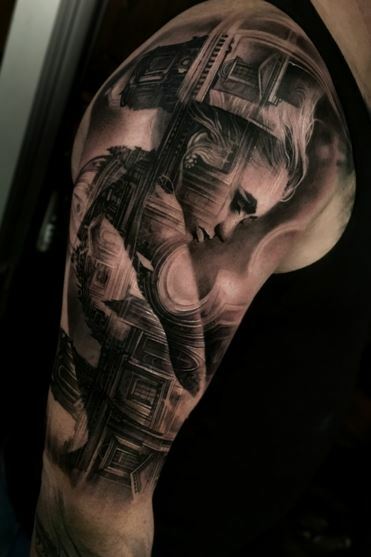 A: The understanding of technique, skin type, and yes tattoo ink is very important. I've used the same bng pigments for ten years. It's easier to build and adapt muscle memory when using the same products, machines etc, giving more head space to focus on design. There are lots of rules in tattooing that I believe must be adhered to. 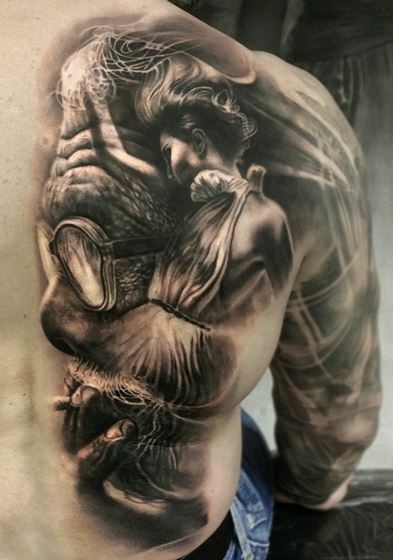 We must do our best to guarantee longevity in our designs, understanding exactly how our designs will age and 'hold' is exactly what being a professional tattoo artist is all about. It's so complicated, but studying, asking questions, learning and application is the key. 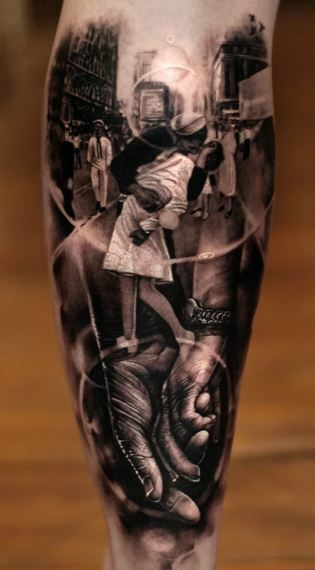 Q: What really makes your style recognizable is the fact that every tattoo is custom made, it's a unique piece. Looks like every design is a dreamy drawing, a beautiful mixture of many images in one... with a bit dark, emotional side too. At least, that's how I see them. I'm fascinated. I bet, creating those design takes time, how do you combine the basic ideas with the final one? A: My process for designing always starts with a sketch, a loose charcoal representation to explore flow and very basic composition. Finding ways to direct the eye and focus. 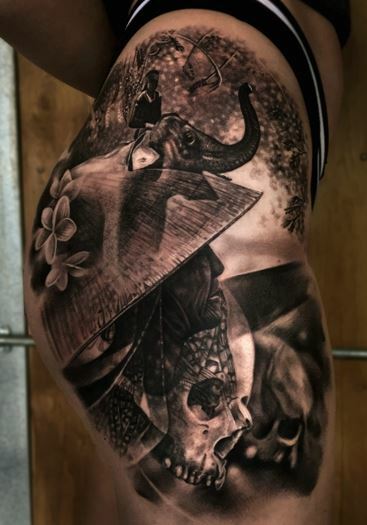 I use many reference points when actually tattooing, trying to utilize every technique I can in the process, but leaving enough out to give clarity and balance. - Do you negotiate with your clients about some ideas? Can they bring some reference images? 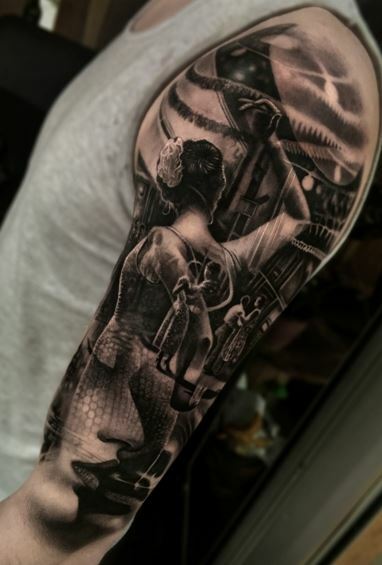 It's very important to work with the client to give them something personal, as we know people get tattooed for a number of reasons, so every process should be new and unique. I don't have a format when I design and I have no interest in pursuing one. I believe that creative individuality was never conceived in the shadows of routine but is found in the beauty of expression and experiment! 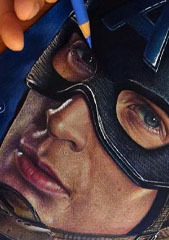 Q: What details or "last touch ups" are the most challenging to work on when it comes to portrait/realistic tattoos? A: The last touch up for me waits until it's healed, giving a few months for the design to really settle in and then taking time to check, step back, squint your eyes and decide what needs darkening and maybe refining. We are not printers and nobody is perfect, we can only do our best to remain professional if our work heals maybe a little too light. It comes with the territory of our canvases being anatomical! We should all love seeing our tattoos age! A: Yeah, I've experimented a lot with color over the years. I still do dabble on occasion, I just prefer how black and grey looks over the years. This is in no disrespect to color tattoos, it's just my preference. I dream in black and grey! Q: You also paint a lot. I love it. Your paintings reminds me a lot of your tattoo style. What supplies do you use for your paintings? A: I always seem to be changing my art supplies, I think its important to experiment, but like tattooing there is a side to artwork which is a more of a craft. 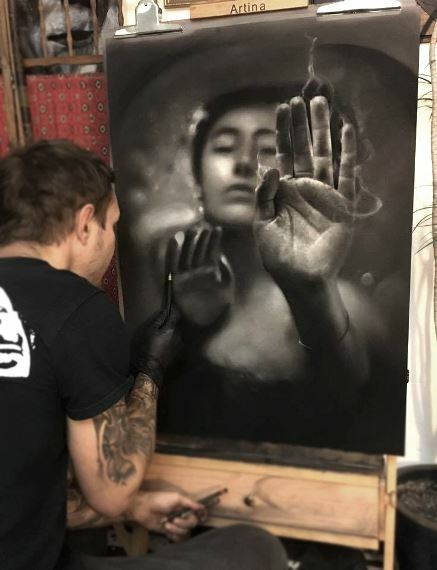 Such as certain types of charcoal and pencil that mix well with each other, or certain paints/mediums that mix well together; deciding which to use is what makes our art unique. There are endless online resources available now to research products, but I prefer to just physically try as many products as I can, and learn what's best for me. The process to me is everything and I know I will be happier with my process if I explore every angle, balancing my frustration with content. We have to do paintings we aren't happy with to understand why we like the ones we do. The secret is how to know what we really like; see through what is expected of us as artists and use our creativity to actually be truly creative! Q: You meet lots of different people every day, working as an artist, you listen to people's stories while making their tattoo, did you learn something about life from their experiences? : ) how is your approach with your clients? A: Yeah, it's a very much a personal profession! Now, spending multiple day sittings with clients, you have the opportunity to really get to know people. However I leave it up to them. I try to simply treat everyone with equal respect, that I expect towards me. Everyone is an individual, so I create space for that. My studio isn't a tattoo factory, if clients want to chat, ask questions, watch a movie, I'm fine with it. I try and go into every tattoo knowing how much of a big deal it is for strangers to trust people based on their portfolio and rarely about their character and personality. So I let them be in control. Q: What reaction from a client makes you loving your work even more? A: My tattoo sessions are always very long and very exhausting, for both of us. So you definitely see people at their extremes of their emotions! It's always great to see clients see the final piece in the mirror. What a great job I've got! A: I have recently opened a private studio in the Mendip Hills about 30 minutes drive from Bristol in the U.K. It is a private studio attached to a beautiful space with self contained flats for clients/guests to stay in and several other workshop spaces. All hand built into a old quarry on top of a beautiful hill with far stretching views. The studio is a completely hand built, oak framed structure with glass sides to take advantage of the views. It's a very peaceful place to get tattooed with close enough links to Bristol which is an awesome small city. I'm so happy to finally offer a space to get tattooed in that I want to work in myself. - How much clients usually wait for their appointment? Q: As an experienced, professional artist, what are some of the biggest mistakes when it comes to progress in this field? 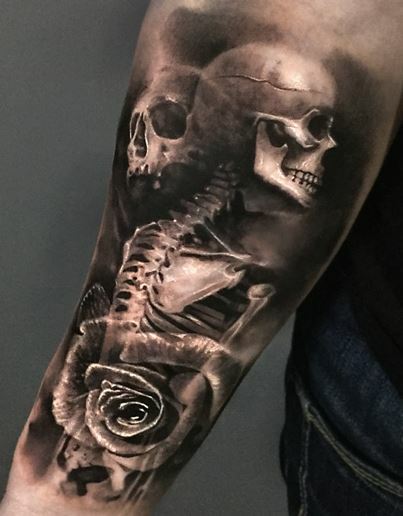 What my beginner audience should know before they even think to start tattooing? 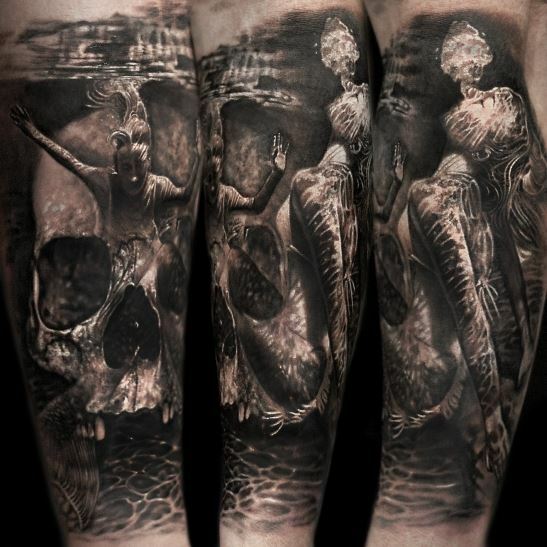 A: I'm fully encouraging of anyone who wants to have creative jobs such as tattooing. I believe the hardest thing to try and teach people is to simply think for themselves! Try to question everything! See through everyone else's processes and be proud of your own! Which is hard with the bombardment from social media and modern day culture to work work work! Having a good portfolio, making money etc. won't mean anything without truly enjoying the process of getting there. Balancing the frustration with enjoyment, and recognising one can't exist with the other is the key. The secret is balance! Your greatest teacher is your last mistake!